Take full advantage of your home by extending your living space! Enjoy your backyard with no reason to go inside! Take full advantage of your home by extending your living space into the great outdoors with outdoor living solutions from Outdoor Environments Since 1991, Outdoor Environments has been providing Kansas City homeowners with amazing custom decks and outdoor living spaces. Adding outdoor living space to your home not only provides your family with additional functional space and a place to relax and enjoy nature, but it will also increase the value of your home. At Outdoor Environments, we strive to create the perfect outdoor living design solution for your home, blending your home's architecture and design with the surrounding environment and landscaping. Outdoor Environments is committed to providing an outdoor living space tailored to your specific needs while staying on time and on budget. Outdoor Environments specializes in outdoor living and custom decks, unlike many other general contracting companies that include these services as part of a wide range of construction services. 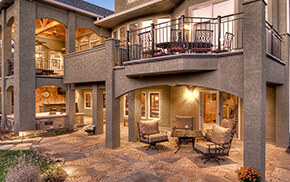 Our expert team consists of licensed and insured craftsmen, including NARI certified remodelers and carpenters. A licensed engineer is also available for projects requiring those services. Whether you're looking to add a simple deck or patio or want to create the ultimate outdoor living space, Outdoor Environments can bring your ideas to life. 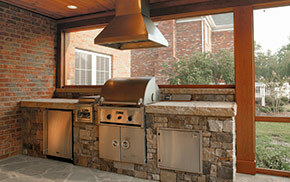 To schedule a complementary consultation, call Outdoor Environments at 913-897-2706. Custom Decks, Outdoor Living, and Hardscapes, Which is for Me? 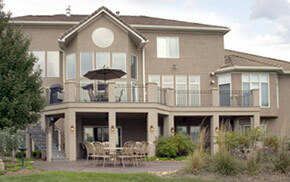 Decks are a wonderful way to enhance the usability and enjoyment of your yard. They can also add curb appeal to your home and increase resale value, offering an average return on investment of 72 percent. Whether you're looking to create a place to kick back and relax, gather for family celebrations, or spend a romantic evening under the stars, an outdoor living space from can help you bring your dreams to reality.